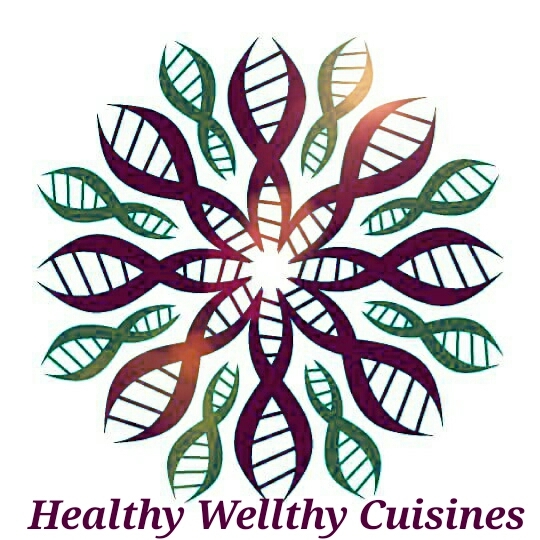 Have you ever wondered how Indian Festivals are associated with seasons and seasonal food? During Holi time, when summers start approaching, we enjoy Thandai which has cooling effect. 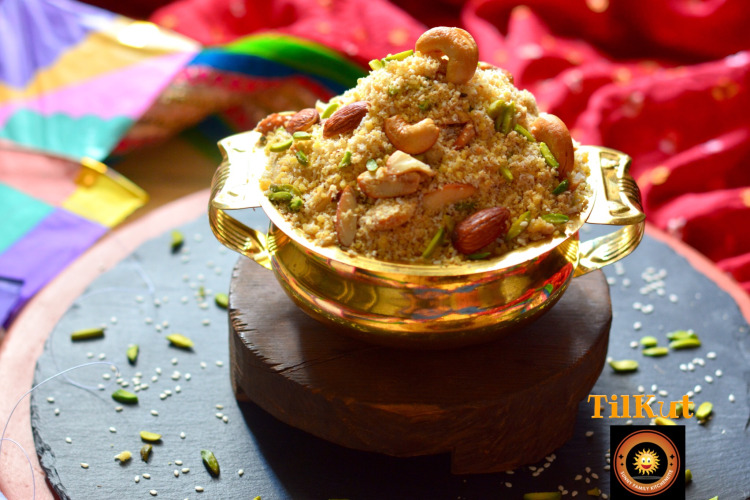 During Diwali time, we enjoy all fried and sweet delicacies as the season is approaching winters at that time. Similarly the festival of “Makar Sankranti” is best known to enjoy delicacies made with Sesame seeds. Makar Sankranti is a famous Hindu festival which falls on 14th January. It is also the first festival of the New Year. Makar Sankranti is a festival dedicated to the Sun god. It marks the transition of Sun into the zodiac sign Capricorn (known as ‘Makar rashi’ in Hindi) and this transition is called as Sankranti. The day is celebrated by flying kites, preparing and distributing sweets made of sesame seeds and meeting and greeting dear ones. There’s a very famous phrase in Marathi (Language spoken in Maharashtra, India) which is used to greet friends and family on this occasion of Makar Sankranti. 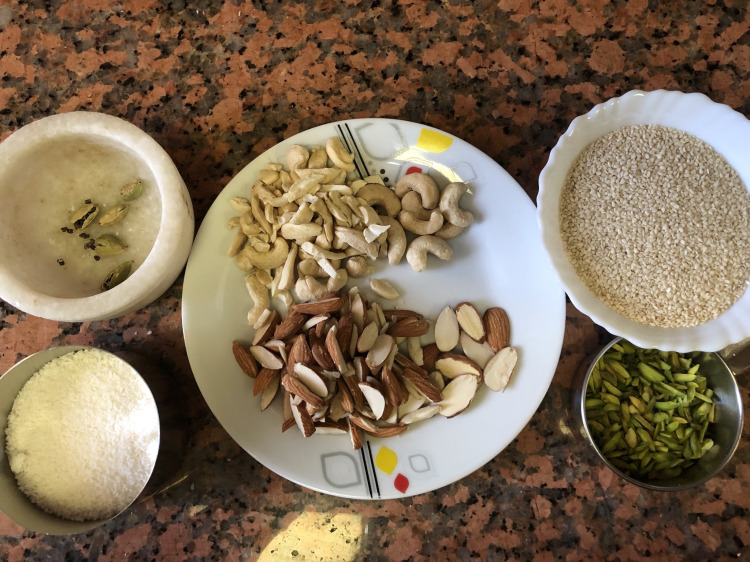 Til means sesame seeds, gul means jaggery, ghya means to accept, goad means sweet and bola means talk. So this Marathi phrase literally translates to- Accept this Til-gul sweet ( sweet made with sesame and jaggery) and speak sweet words. The underlying thought in the exchange of til-gul is to forget the past ill-feelings and hostilities and resolve to speak sweetly and remain friends. Leave all the grudges, enmity and quarrels from the past with everyone and start afresh. Some very famous and popular Sesame seeds delights which are enjoyed during this festival are, Til ladoos and Til chikkis. 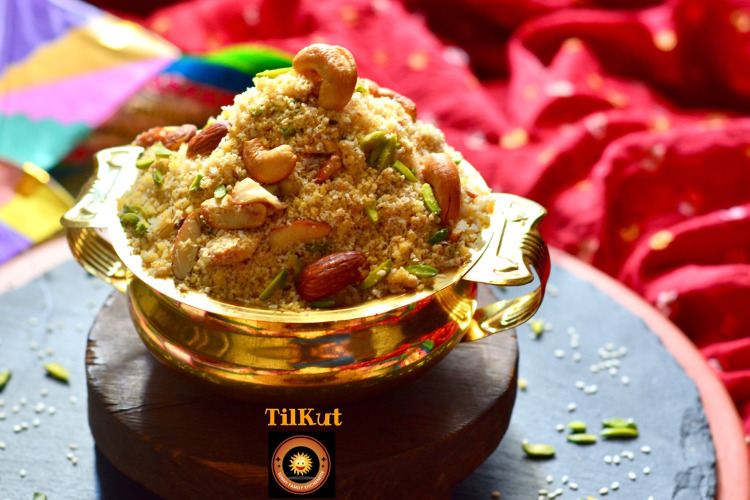 I have prepared Tilkut to enjoy this very special festival. 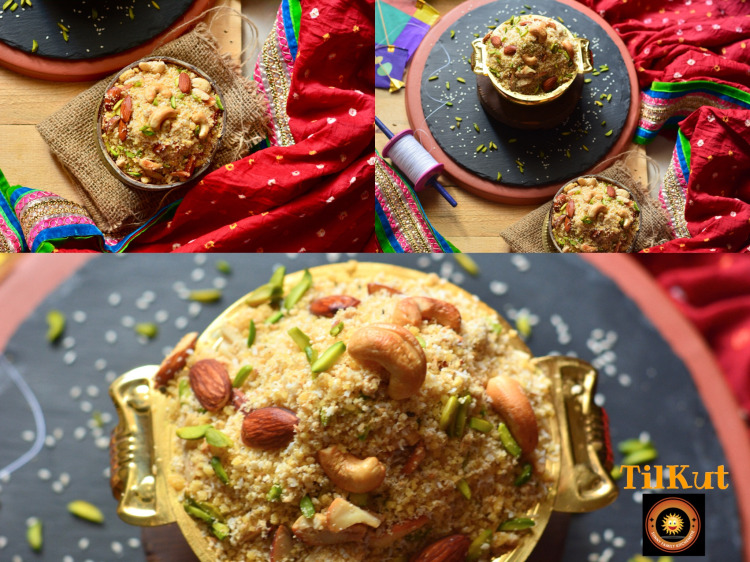 This is a traditional dessert and is especially made for festivals like Sankranti and Sakat Chauth. 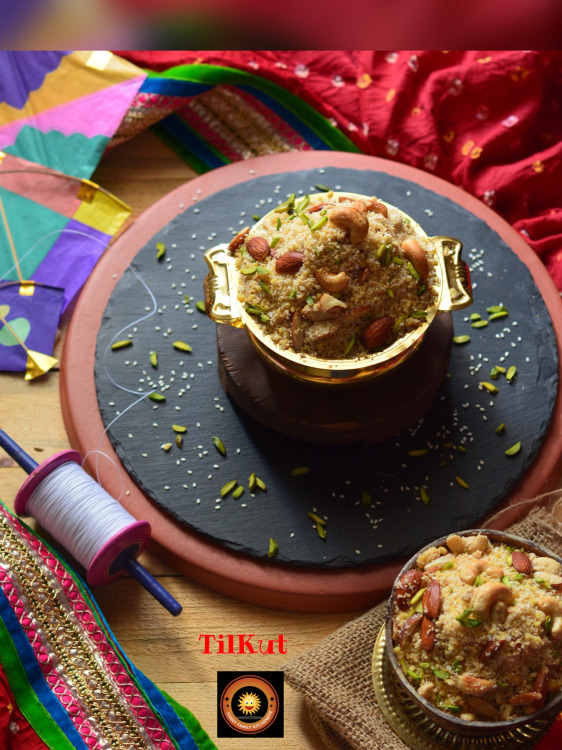 I remember my Mom used to make this Tilkut on every Sakat Chuath Fasting Day (another Hindu Festival). We all used to love eating Tilkut made by her. 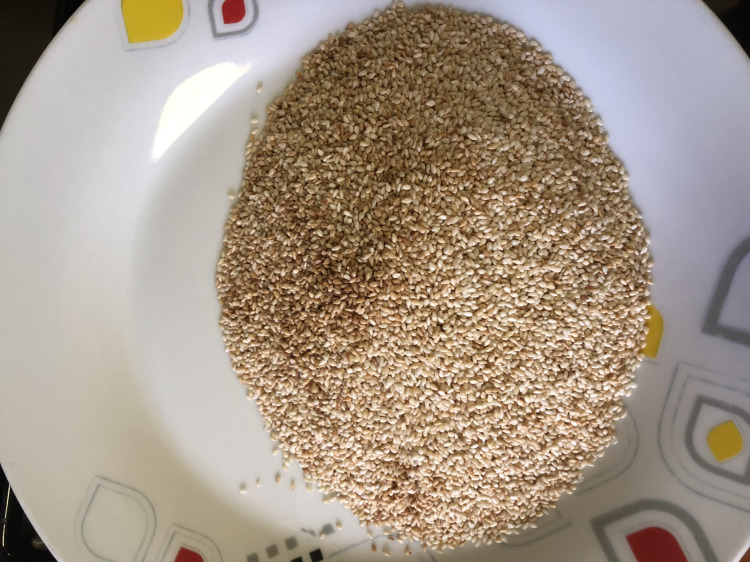 Her version is just two ingredients wonder, sesame seeds and sugar powder. I have twisted the recipe a little bit. 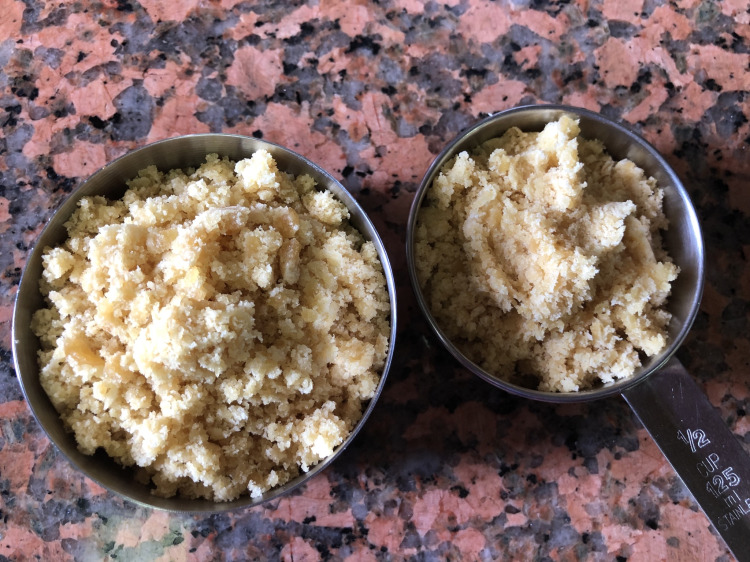 Instead of sugar powder I have added Jaggery powder which has got many health benefits. And I have added few nuts too to give it a rich look. 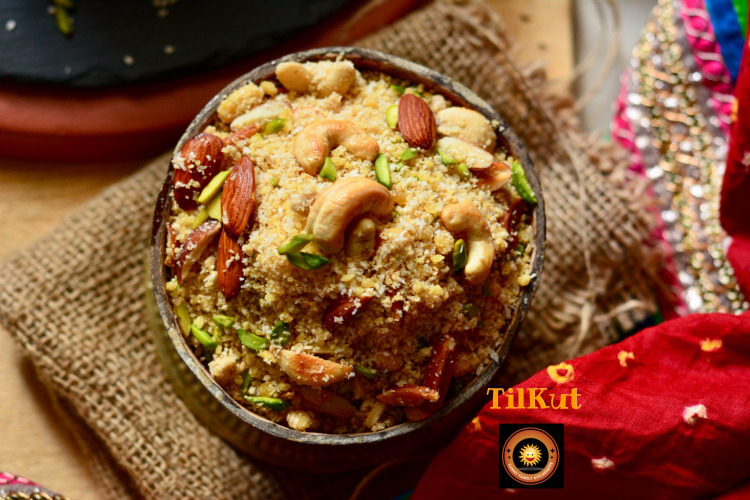 Tilkut also know as Til Kuta means pound/grounded sesame seeds added with sugar powder/jaggery powder. 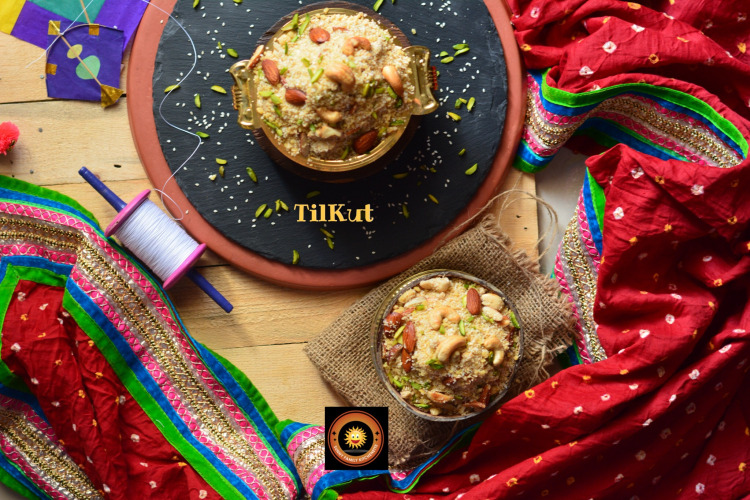 Tilkut is very easy to make and it takes very little time to make it. 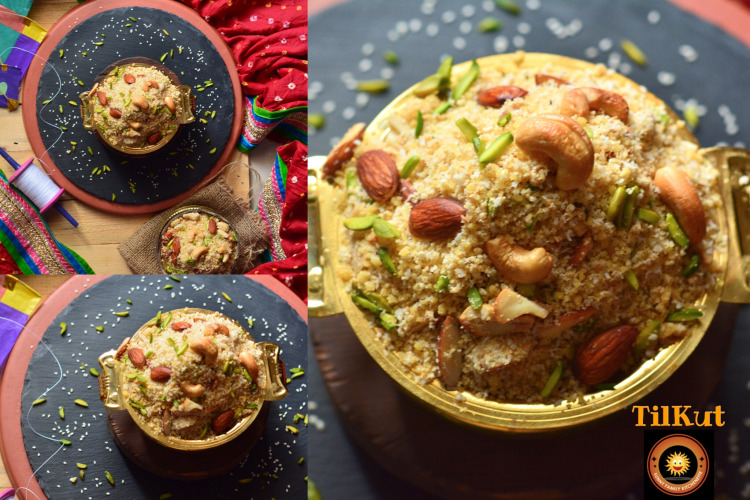 Who needs to wait for any festival when the recipe is such an easy one and also very healthy too. 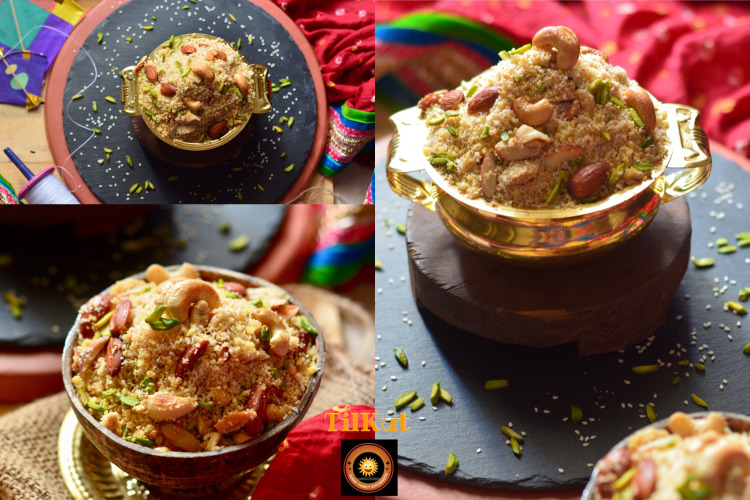 Do try this delicious tilkut recipe during this winter time. 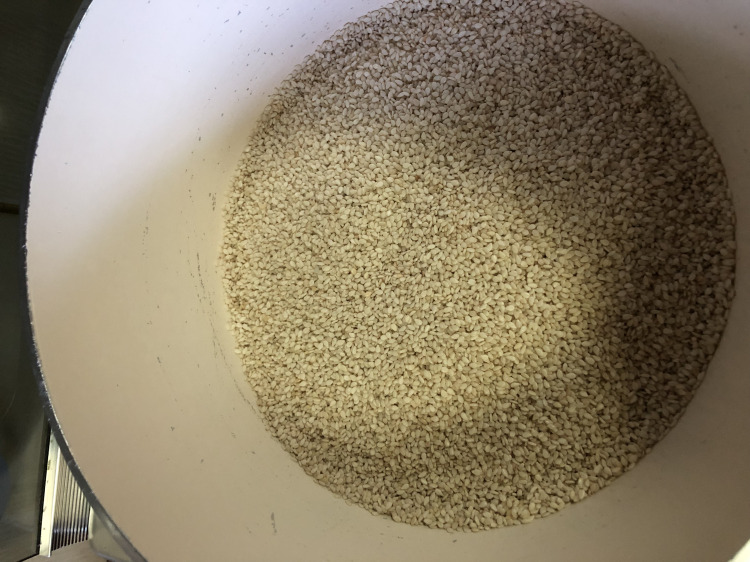 In a pan dry roast the white sesame seeds on medium to low heat until aromatic (takes about 4-5 minutes). Be careful when you roast the sesame as it splutters. Take it out and Set aside. Let it come to room temperature. 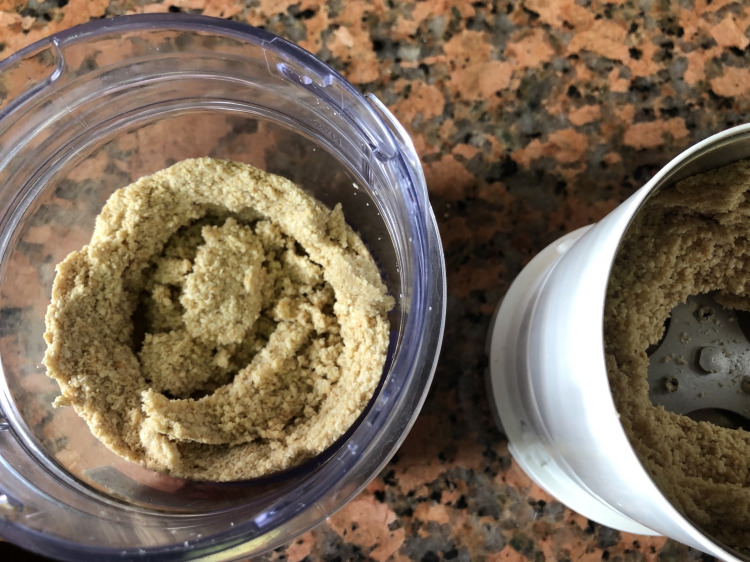 In the same pan dry roast coconut powder for 1-2 minute. Put ghee in the same pan. 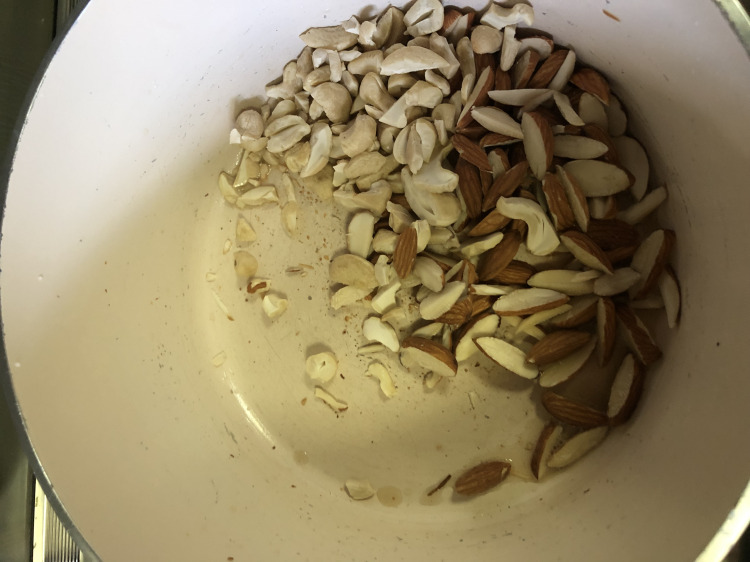 Roast chopped cashews and almonds till golden brown. 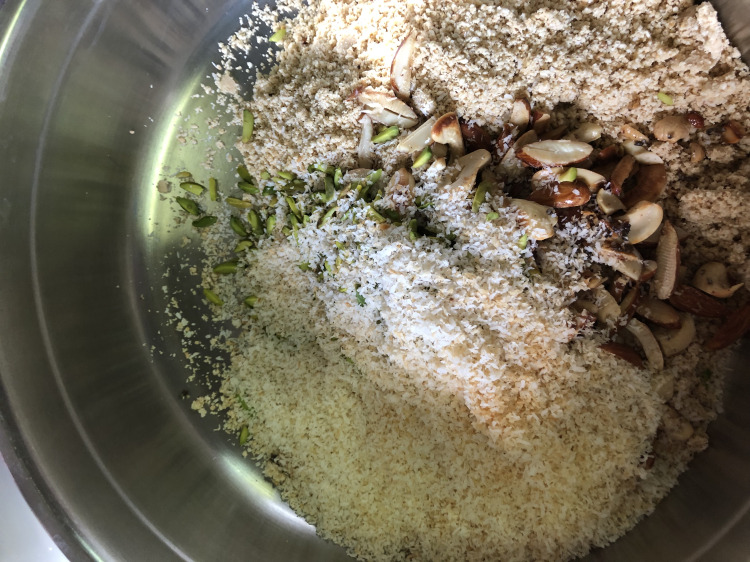 Remove the seeds from the Cardamoms and coarsely ground them. By this time roasted sesame seeds must have cooled down. 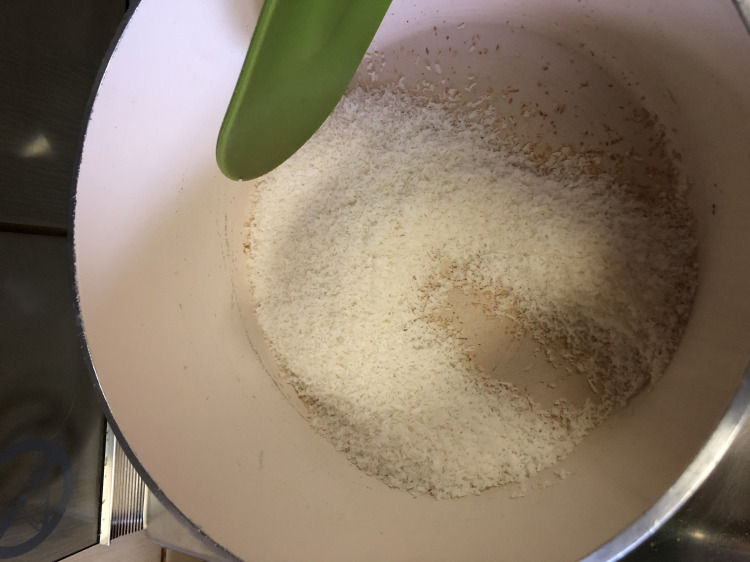 Coarsely grind them in a grinder. 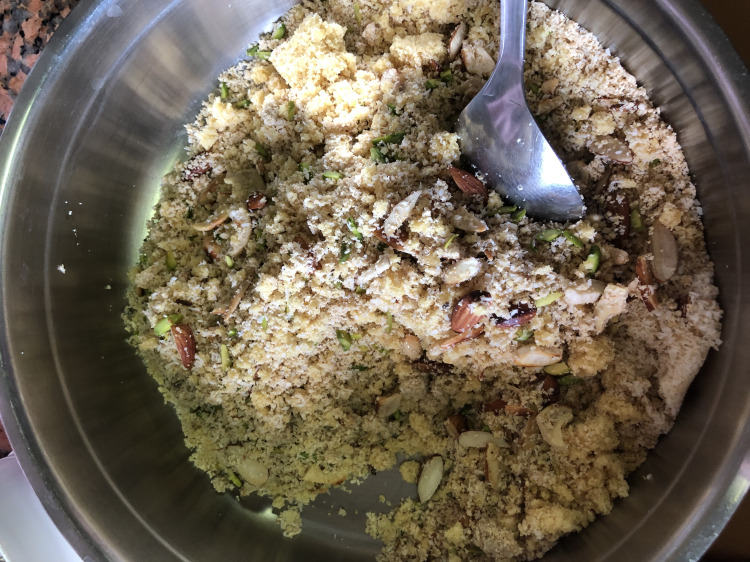 Mix everything together grounded sesame seeds, roasted coconut powder, nuts, slivered pistachios, grounded cradamom seeds and jaggery powder. 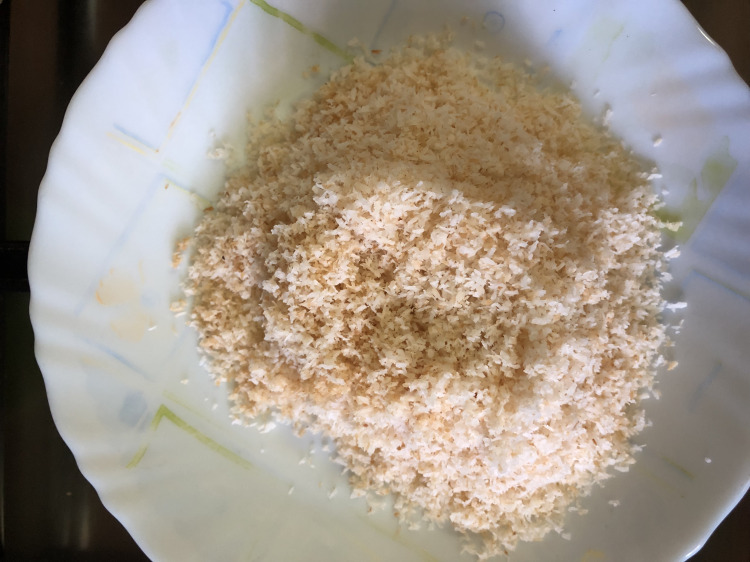 -Instead of jaggery powder you can use sugar powder. -You can avoid nuts if you don’t want them.